A new lawsuit is reportedly asking for over $10 billion in damages from Apple, on the basis that the company is infringing on an "Electronic Reading Device" concept invented over 20 years ago. 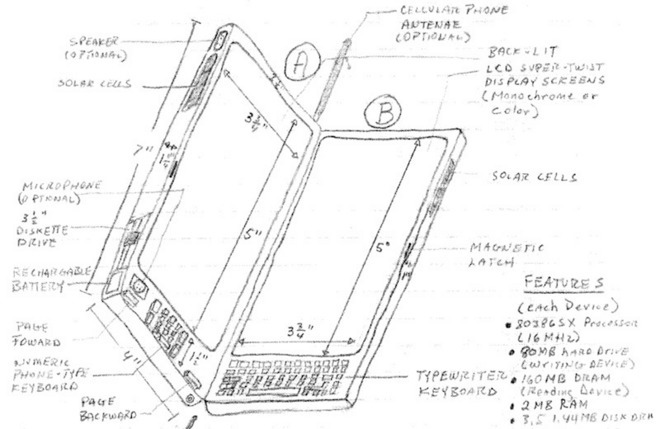 The plaintiff, Florida's Thomas S. Ross, alleges that Apple's iPhone, iPad, and iPod lines copy ideas found in three technical drawings he produced between May and September of 1992, according to MacRumors. The illustrated device includes features that would eventually become standard in smartphones, such as a touchscreen, cellular link, photo and video browsing, and internal and external storage. Some unusual elements include a folding dual-screen design, solar cells, a two-part hardware keyboard, and a 3.5-inch diskette drive. The case doesn't appear to have many solid legal foundations. While Ross applied for a utility patent in November 1992, the U.S. Patent and Trademark Office declared the filing abandoned in April 1995 since it never received application fees. In 2014, Ross filed to protect his drawings again via the U.S. Copyright Office. In addition to a minimum $10 billion payout, Ross is seeking royalties up to 1.5 percent on infringing products. The complaint calls for a jury trial, but if the case isn't dismissed outright Apple will likely settle out of court for a small fraction of the demanded money. The company occasionally deals with frivolous lawsuits, such as one which named U.S. presidents, judges, and celebrities as fellow defendants, or another connecting Apple to the Italian Mafia.